Linda is our Head Nurse at the hospital in Barton. She joined Boness Vets in 1993 and has been an indispensable member of Julia’s team ever since. Linda has worked in small animal and mixed practice prior to this. 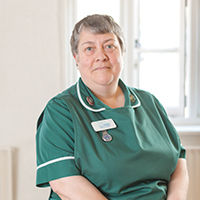 She gained her nurse assessor qualification in 2000 followed by the Internal Verifier qualification in 2001. This has enabled Linda to carry out a lot of clinical coaching & training of veterinary nursing students both at Boness Vets and other practices. In this way Linda has been able to share her wealth of knowledge and experience with many other veterinary nurses. Linda has one cat who she hand reared from a few days old. In the last few years he has developed inflamatory bowel disease. Linda says “it is quite a challenge managing the condition & keeping him well & happy”.